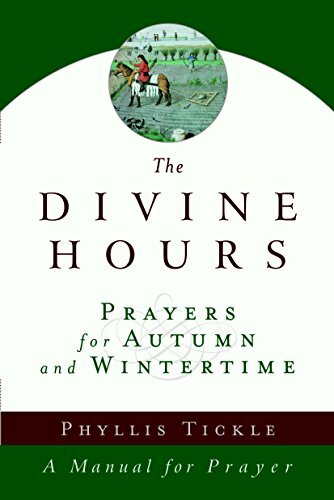 "The Divine HoursTM is simply the best book for people who want to work prayer into the fabric of their daily life." "A welcome remedy for the increasing number of lay Christians who have rediscovered the Daily Offices . . . Tickle puts each day's prayers, psalms, readings, and refrains--everything you need--in one place . . . The rhythm that Tickle's book establishes gives one a stronger sense of participating in an ancient, worldwide but very personal liturgy." Phyllis Tickle, founding editor of the religion department of Publishers Weekly, is one of the most respected authorities and popular speakers on religion in America today. She is frequently quoted and interviewed both in print media, including the New York Times, Washington Post, Newsweek, and Time, and in electronic media, such as CNN, C-SPAN, BBC, and "Voice of America." She appears frequently on the Odyssey Channel and is a regular guest on PBS's "Religion & Ethics NewsWeekly." She is the author of over two dozen books, most recently Emergence Christianity: What It Is, Where It Is Going, and Why It Matters. She lives in the rural community of Lucy, Tennessee. Visit the Divine Hours website at www.thedivinehours.com. The Divine Hours is a trademark of Tickle, Inc.